I can’t believe I’m actually sitting on a newly painted, AND clean patio, compared to just one short week ago! It must have been all that rest we took this summer. I knew once home I’d be antsy to get productive, but I had no idea I’d be doing this! To recap, I wrote HERE about how I was shamed into finishing my house, rather than redecorating the same things. 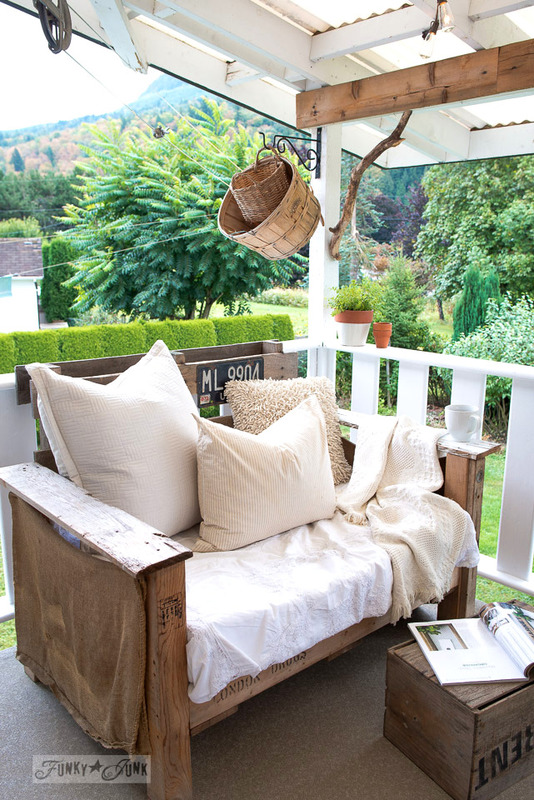 But once the dream farmhouse tour took place, even more motivation struck! Besides, sitting on a dirty patio after having enjoyed pretty ones all summer just wouldn’t do. So out came a paint brush, and I got to work. And I am just loving the clean and very woodsy result! 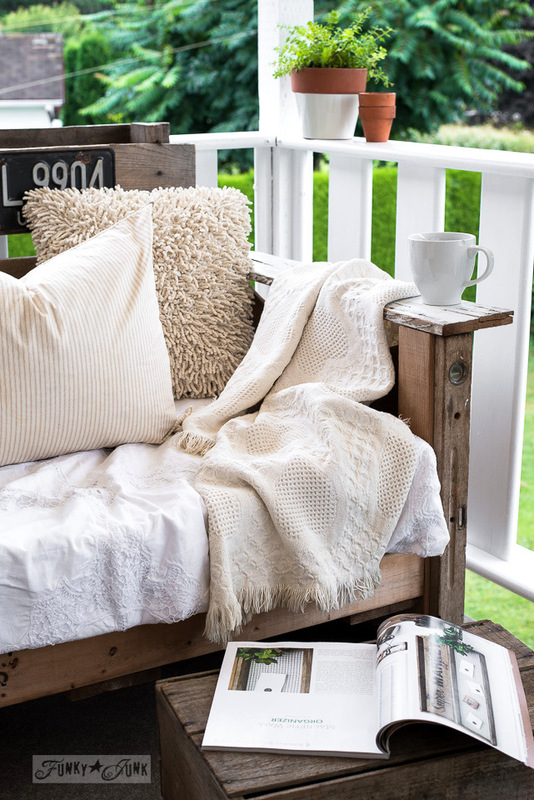 This pallet chair got a quick makeover with a white duvet cover, and piled on tone on tone pillows and blankets. Simple, comfy, easy to bring inside during poor weather or to clean… and best of all, free! A black license plate brought a little accent into an otherwise all whitish palette. And you KNOW I have to try out my coffee mug everywhere I go. Wider armrests come in mighty handy! 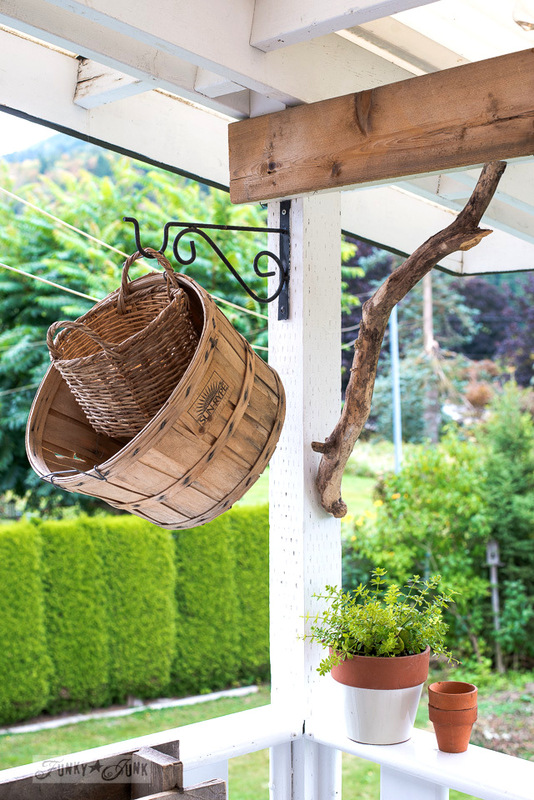 Because the laundry line is right behind the pallet wood chair, two baskets were hung inside one another, the big one for laundry, and the small one holding clothespins. Along with a branch corbel for good measure. 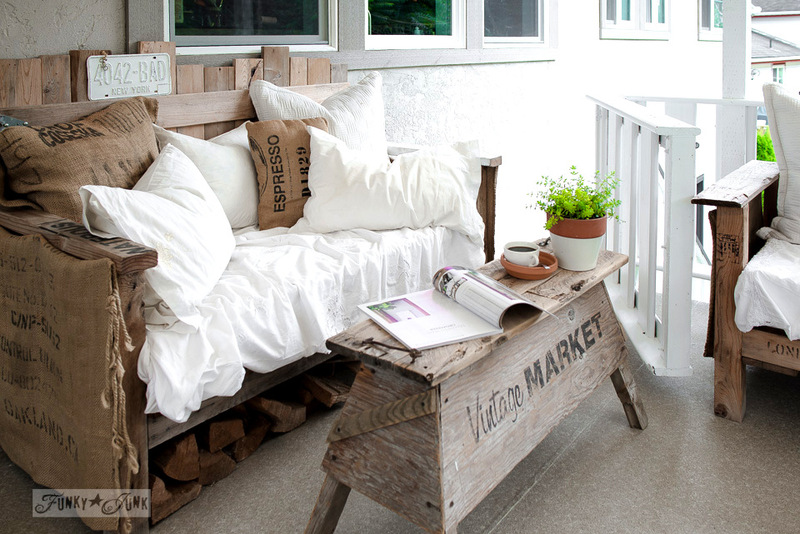 The pallet wood sofa was decked out in much of the same kind of look, along with burlap pillows. I have visions of changing this out come fall, with some plaid flannel. I’ll be on the hunt! 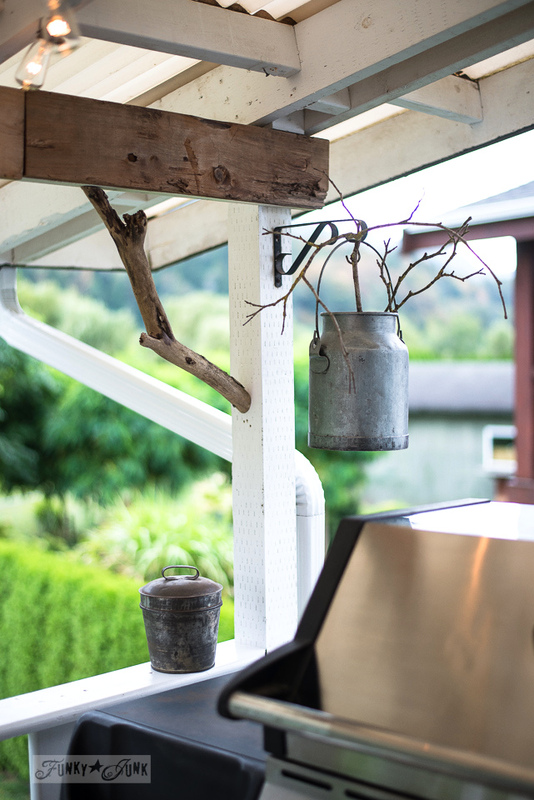 This branch ladder flower stand was created last summer. And while I loved it, I had something a little more productive in mind this year… using that same table. 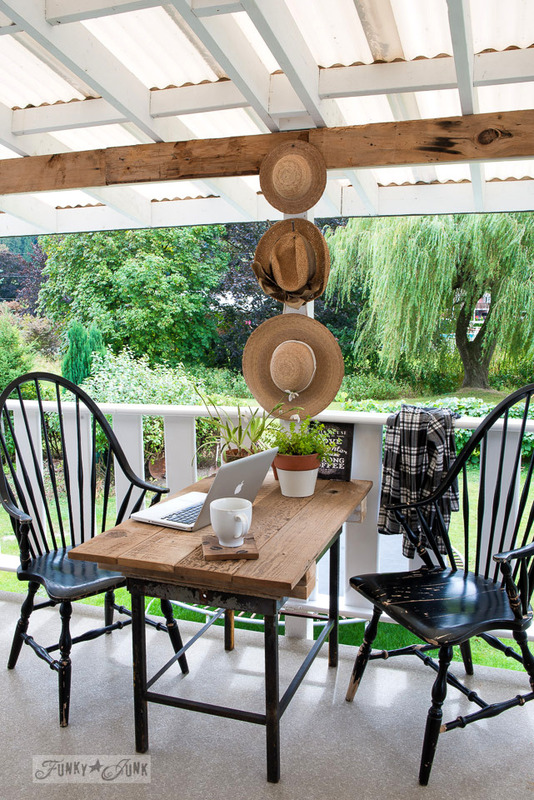 It’s now a little farm table, perfect for setting a plate or two down, or browsing online! 1. Either make a base, or find something that could work. 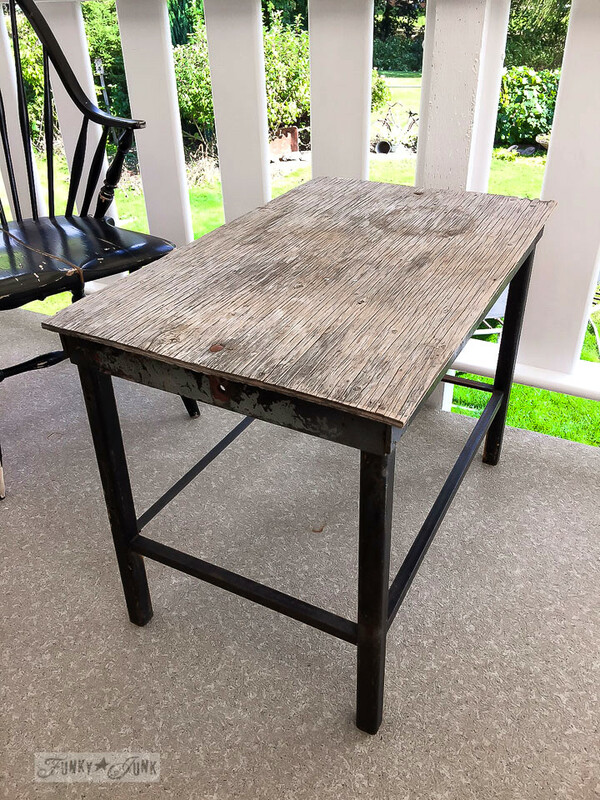 In my case, I had this curbside metal table with a wood top. 2. Determine the size of your table based on the top boards you have to work with. I lined up 4 fence board planks to determine mine, then cut them all the same exact size. 3. Cut 4 2x4s to the same size as the table top planks. Stack 2 on each side, then attach with screws. 4. 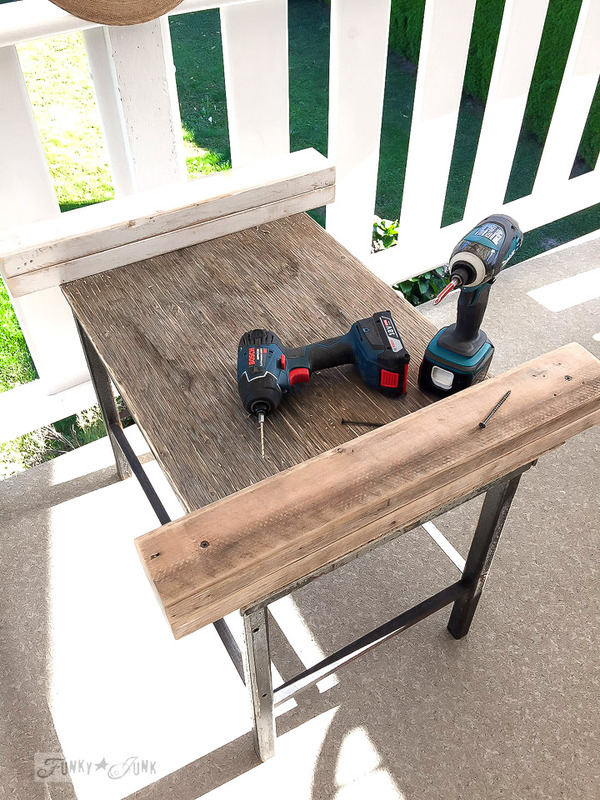 Place planks across the 2x4s, then attach with screws. And you are done! In minutes. 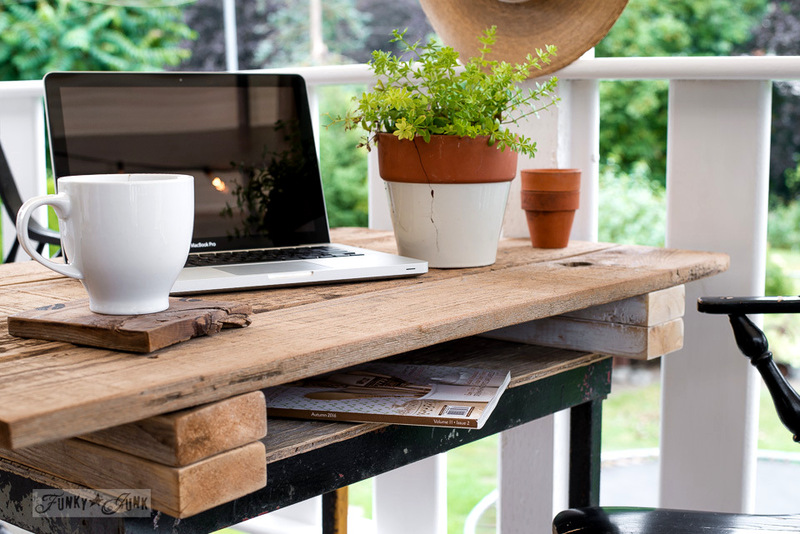 Adding height to a smaller table allowed for a storage area, perfect for the laptop, books, or even coasters / placemats. The three straw hats came home with me from Hawaii, found at a thrift store. I’m glad I jam packed them in that very full luggage now! I love how they add a summertime touch, along with some great texture. 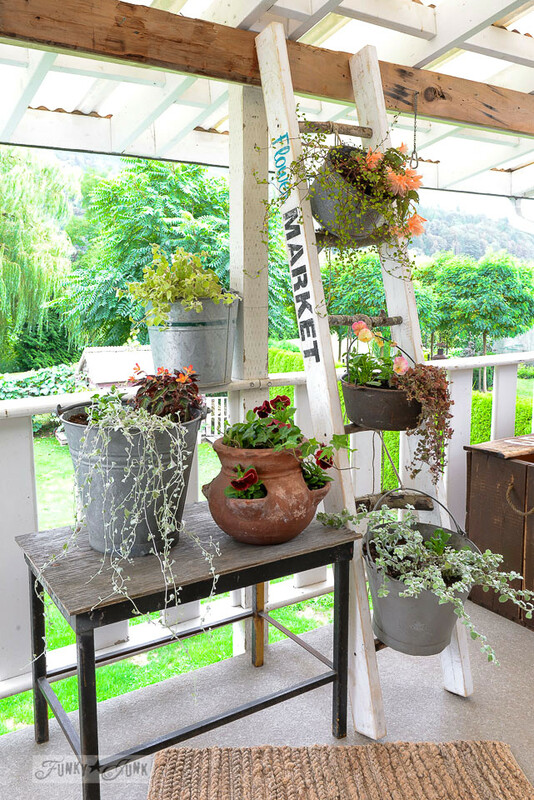 No need to stick to just hanging baskets when you have a few hats on hand! 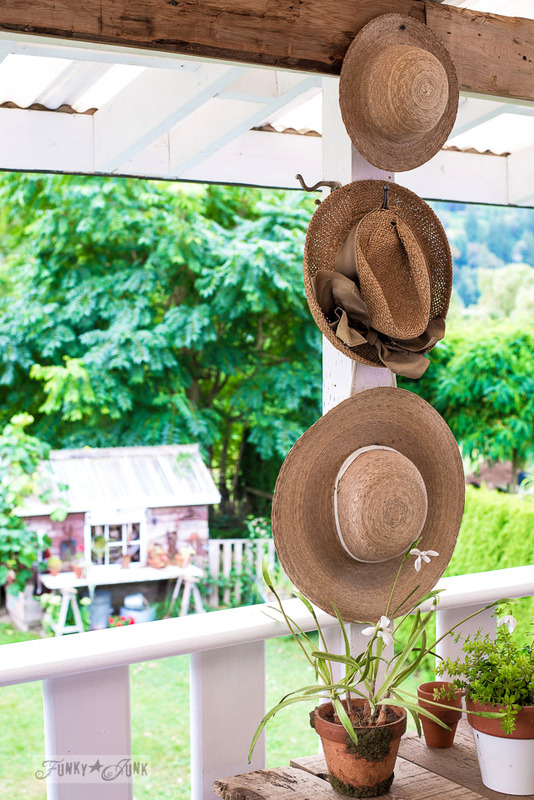 I was inspired to collect straw hats when I came across what Lucy at Craftberry Bush did with hers. Isn’t this wall divine? And I LOVE this simple one hat with an oar. 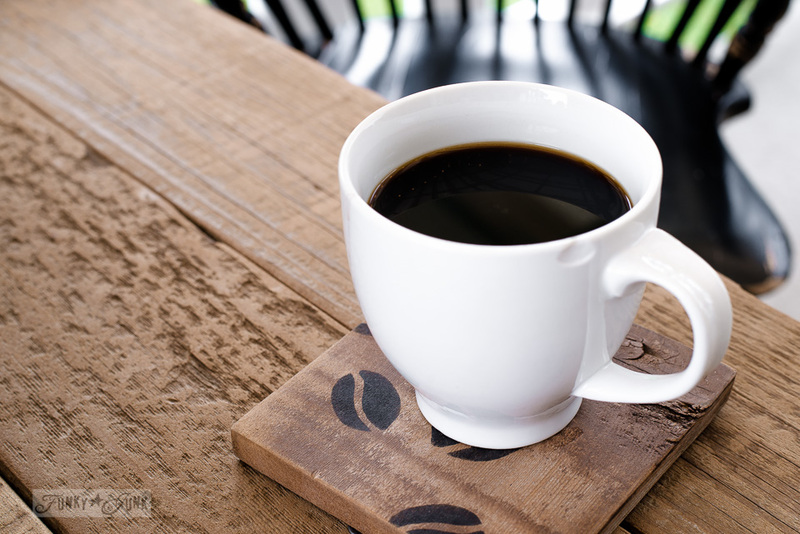 The little reclaimed wood coasters imprinted with coffee beans (using THESE stencils) are simple, yet perfect. I actually have a story about this cracked white mug… another Hawaiian trinket. When I visited one of my now fav places for breakfast on Maui, they handed me this cracked, oversized mug. I nearly asked them for another, but then I just rolled with it. The coffee ended up being SO good, I blamed it on the imperfect mug. You know how a good mug makes coffee better, yes? When I made a return visit, they handed me a standard schmandard mug. When I asked for the cracked mug again, they said they were retiring it, as it was just from a thrift store. So I asked if I could purchase it… but they did one better, slipping it into a bag for me! I’m so glad it got home safely. I use it EVERY DAY. I’m embarrassed to admit, I never did replace an old, removed light on the patio from 8 years ago, so it’s presently lightless. 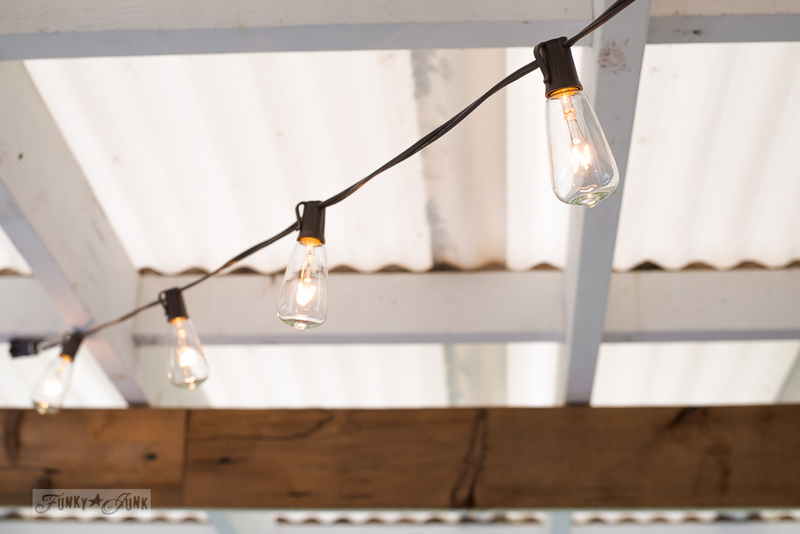 But these edison bulb styled patio lights work like a charm! In fact, they work so well, I unscrew every other bulb to dull it down some! Found at Canadian Tire in Canada. And here’s the currently unpretty side of the patio. 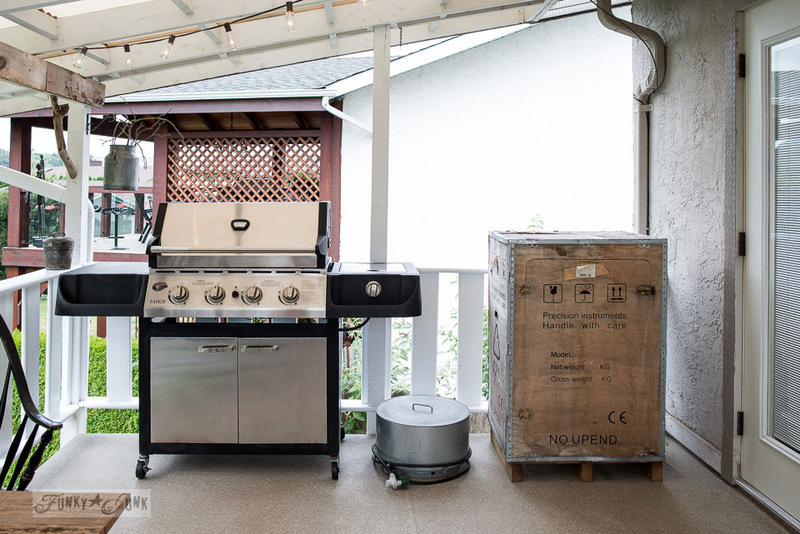 I have visions of creating a farm styled rustic table or cabinet with doors, with a shelf underneath, to house and hide a new, smaller table top grill and the propane fire pit. I think a long table would better service this area, creating more surface for entertaining, and give this end a more streamlined look. I may even incorporate the firewood storage, which is currently sitting inside the crate cabinet. But these upgrades may wait until next spring, as this is really more a want vs. a need. Remember my mantra, finish the house first, then do fancy stuff? I’m trying to be a good girl! 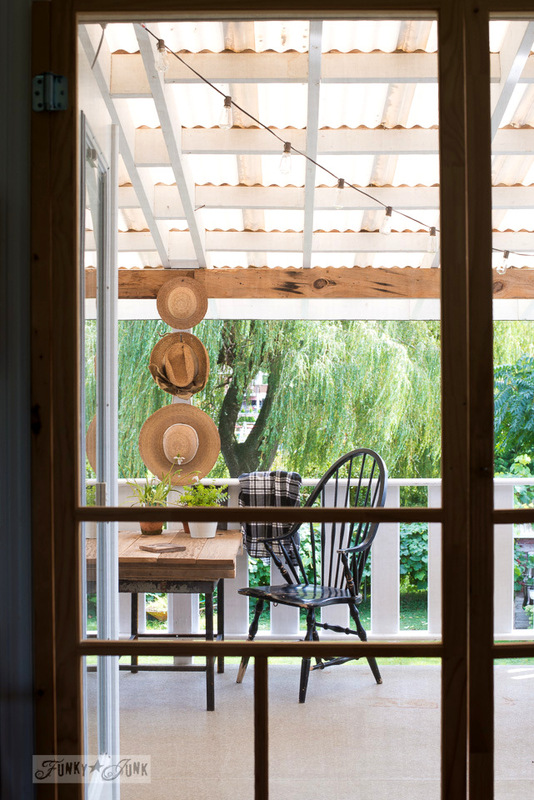 Looking through the DIY wooden screen doors from the inside of the house, it looks mighty enticing out there. I’m just glad my little cleaning spurt turned into a full fledged revamp! Your porch looks really nice. The paint job really freshened up the spot. What a good idea to design the table with a spot to store items. I look at it and am like, whoa, that’s cool. Why didn’t I think of that. Looks great Donna! I’ve been waiting for this! What an awesome refresh, D! So well done as always. 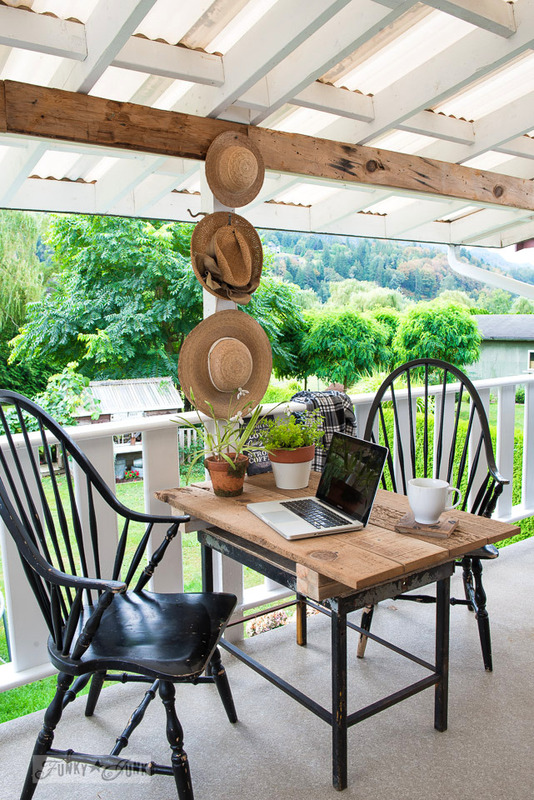 Awesome space and I love that little farm table. You’ve inspired me – to keep cleaning out because I’m ready to move on and create a new environment. Tempted to do that here but with us getting ready to sell I think I’ll keep dreaming. Always enjoy stopping by and seeing what you’re doing. Thanks Carole! And I’m glad you’re saving your mojo for your new space and story to come… I cannot WAIT to follow along that one! Glad to see someone else is having to do the stuff you really wish would just be done when you woke up some morning.. I have a large porch also.. ALL white and grey. Loved it when we bought the house but every year it becomes more of a chore to keep it pretty. I do love the southern feel of it though. Love your sofa. When are the new stencils coming out? YES. I know the big porch syndrome very well. Honestly? 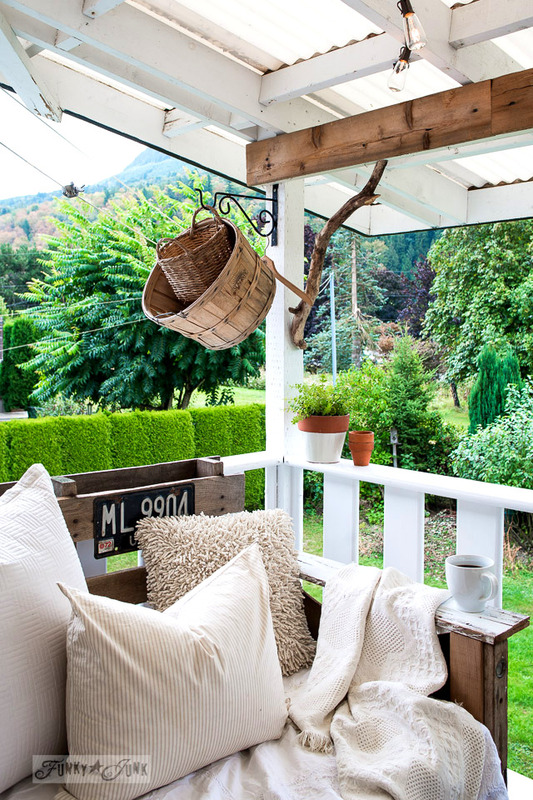 This one is plenty big enough to keep up, but I admit, there is NOTHING like a huge porch. Some new stencils are on their way hopefully mid September! 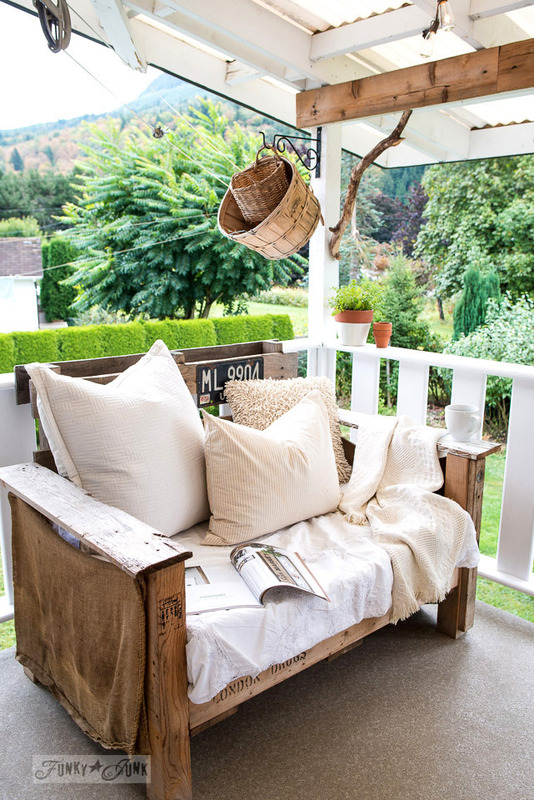 The porch looks wonderful! Paint helps to freshen things so, and I love the reclaimed farm table. A very nice touch. You certainly have been busy so go ahead and enjoy that mug of coffee. You deserve it! Donna, I would love to get you that cattle feed sack,just because?You bring such joy to us and I would like to do something nice for you! Please let me know where to have it sent and I would be happy to get it for you. Oh my goodness Linda! I don’t even know what to say… what a most lovely gesture, but so not necessary! But isn’t it the coolest find? So adorable! Everything looks wonderful, I can see myself out there with my coffee in the mornings then having lazy afternoons with ice tea in hand. I love old straw hats, my love affair started with them when I moved to this farming community and I was working as a Hospice nurse visiting some of the farms and seeing some of the old hats hanging by the back doors, and it occurred to me that old straw hats are like faces they all have a story. I have aquired a few not as many as I would like, but there is such a thing as overkill I guess, but if they could talk what stories would they tell. You make me feel so ashamed of myself, I have a really nice big covered patio and it is such a mess, but it has been so hot I just can’t get out there (worst heat in years). The views you have from your home are so beautiful, I don’t know how you get anything done. 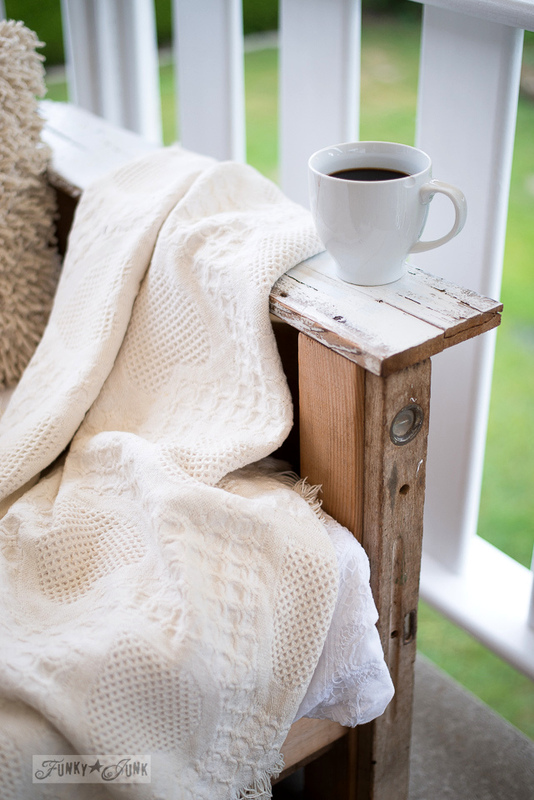 Your pallet furniture looks so good and so comfortable, I can just picture the plaid flannel in the fall (can’t wait for fall). Are those chairs the same as the Amazon ones? They’re beautiful! Hi Alexandra, I’m afraid not. Mine were found at a thrift store a few years back. No idea where they are originally from. I believe they are antiques. There you go inspiring me again. When you cleaned out your storage, I had to clean out mine too. 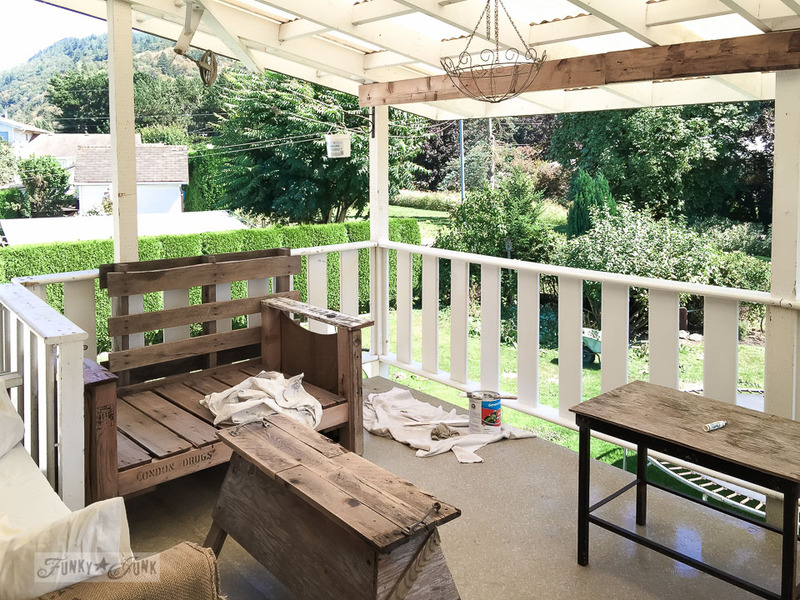 Now I’m looking at my deck thinking, it could really use a coat of paint (and I didn’t even spend a month in Hawaii). Oh, and I love the table too! Ohhhh those hats are addicting! I’m looking everywhere for them now! I forgot to mention my inspiration. Adding that to my post now! I love it! The pallet chair and sofa are my favorite!! Thanks Tania! They’re still going strong after a few years I’m happy to say! I think I might try to make one today!! I have pallets and I have 4 x 4 posts!! The hard part will be the cushions. I wonder if the deep chair cushions they have at Lowe’s would work… I’ll have to measure after my chair is done and see. Hi Tania! I found going to an RV place that fabricates foam bedding to be the easiest. They had thick enough stock and could easily cut it to size. But of course, it isn’t that cheap. But for my pallet sofa, they had a used piece that I got for a better price, so it can happen! Keep your eyes open in your local new and used listings too for used ones! As soon as I get that done I’ll be doing a blog post about it and of course I’ll link back to your tutorial! Absolutely LOVE the revamped table. It turned out so cute yet extremely useful. 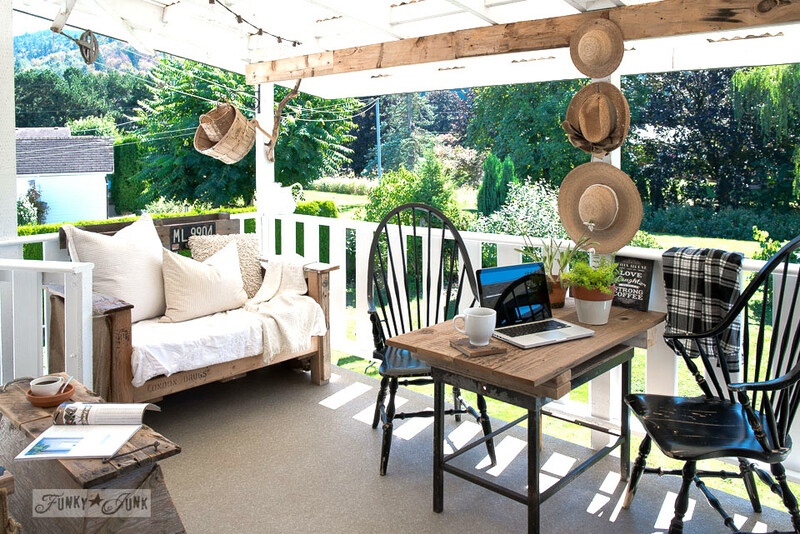 The entire patio looks terrific.